48 www.coalage.com October/November 2017 legally speaking Conf irmation of MSHA Nominee Seems Likely by henry chajet In the September "Legally Speaking" column, Washington D.C., defense counsel Avi Meyerstein dis- cussed his top 10 list of needed Mine Safe- ty and Health Admin- istration (MSHA) reforms derived from his history of contested cases: • Stress safety priorities; • Seek consistent regulatory applica- tions without improper changes; • Accept clear and historically recog- nized compliance mandates; • Require meaningful district manager citation validity conferences; • Appoint a powerful MSHA headquar- ters ombudsman; • Require inspector mitigating circum- stances information collection and training; • Enhance inspector enforcement training; • Require human factor accident analy- sis, including drugs and alcohol; • Recognize agency achievements since 1978; and • Adopt efficiency and effectiveness tools to build on achievements, recog- nizing the steep reduction in the num- ber of mines. It remains unclear whether the United States Congress or the President Donald Trump administration will adopt any of these MSHA priorities soon, or instead will continue to ride on "automatic pilot," set by agency bureaucracy, often promoted to district or national leadership roles by the prior administration. However, progress was made on Oc- tober 4 when President Trump's MSHA nominee, David Zatezalo, a former coal miner and engineer who rose through the ranks to become the chief executive officer of Rhino Resources, discussed some of his safety and health priorities. He respond- ed calmly and professionally to praise, questions, requests and criticisms from U.S. senators, all posed in a cooperative and friendly manner, even by Democrats who earlier had expressed concerns about his nomination, or announced their op- position. Some Democrats already filed document requests with the Department of Labor seeking information about the nominee's prior company. Yet, the tone of the hearing and seemingly unanimous support from Republicans, who hold a majority of Senate seats, led this author to believe that Senate confirmation is likely, before the end of the year. Among Zatezalo's stated priorities for MSHA improvements were promoting new technology and solving technical issues, like those related to proximity de- tectors intended to protect coal miners from moving equipment. Other priorities he described were protection against sili- ca health risks, currently undergoing a De- partment of Human and Health Services (HHS) study, and speeding up the MSHA equipment approval process to permit new safety advances. Among criticisms by Democrats was Zatezalo's company's two "pattern of vio- lations" notice letters, to which Zatezalo replied that he accepted them as a man- agement improvement opportunity, rath- er than as impetus to "lawyer up." Fur- ther Senate questioning led to Zatezalo expressing his support for MSHA's small mines assistance programs, an area of reorganization under the last administra- tion. While the discussion at the hearing addressed general safety and health im- provements, and small mine goals appli- cable to metal and non-metal mining, as well as coal. Almost the entire hearing was focused on the coal industry. Hopefully, the noticeable silence on needed metal and non-metal reforms will be addressed by Zatezalo when he takes office. In fact, he will be faced almost immediately by ongoing rule-making efforts to repair the damage predicted from the former Pres- ident Barack Obama administration's last-minute amendments of the metal/ nonmetal "work-place examination" (WPE) and record-keeping rules. Hearings on the latest MSHA propos- als will be held this month, permitting Zatezalo's input on the final rule, after he is confirmed. Similarly, the nominee will have input into the continuing evolution of the agency's controversial "pattern of vi- olations" rules and criteria. The regulation spurred years of intense criticism, but af- ter an aggressive implementation period, was not used in the last two years of the Obama administration. Zatezalo should be confirmed well before MSHA is expect- ed to conduct its next pattern of violations screening, in mid-2018, to identify candi- dates that may be subject to burdensome and expensive compliance plan or closure order risks. Finally, it is noteworthy that the nom- inee was asked, and promised to return to the committee, to seek help whenever he perceived a funding problem that could interfere with his expressed safety goals. To the author, the question implies an in- creased interest by the members of the Sen- ate Committee to oversee MSHA more in- tensely than they have in the last four years. Henry Chajet is senior counsel with Husch Blackwell. 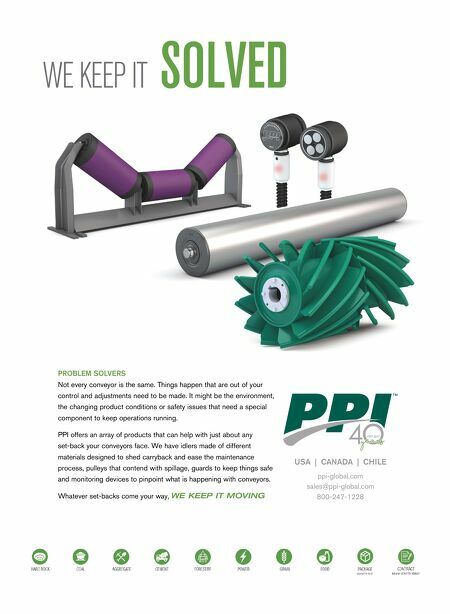 He can be reached at hen- ry.chajet@huschblackwell.com. 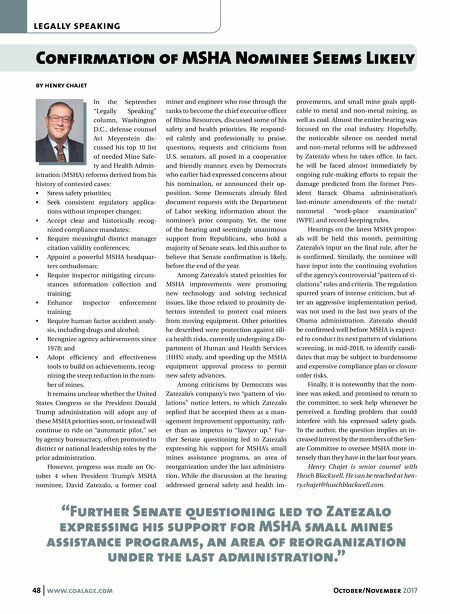 "Further Senate questioning led to Zatezalo expressing his support for MSHA small mines assistance programs, an area of reorganization under the last administration."